Capacity : 0.40 to 3mm Cu & 0.64 to 4mm Al or as required. Number Of Spindles : 4 / 6 or as required. 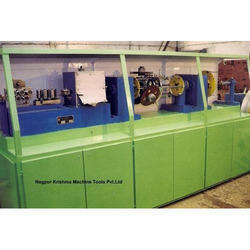 Body : The main frame of the machine is fabricate with thick steel flat to ensure vibration less and smooth running. All the high speed rotating parts are mounted on anti-friction bearings of reputed make. All the high speed spindles are manufacture from EN material for long life and smooth operation. Motor : Individual 0.5 /0.75 H.P Induction motor for each spindles or as required. 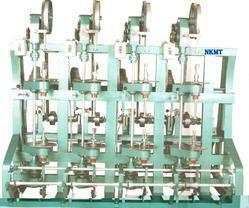 The machine is designed for Double/ Triple Cotton covering on Bare Aluminium/Copper Round/Rectangular wire. Looking for Cotton Covering Machine ?